My college years have a distinct soundtrack, as I am sure so do yours. Perhaps Nirvana’s “Nevermind” or the annoyingly catchy “I Get Knocked Down” pump through your memories of last-minute paper writing and eating ramen. Mine are florid descriptions of early American landscapes read by a posh-sounding Englishman, detailed directions for skinning a deer, and the woeful journey of Tom Joad. 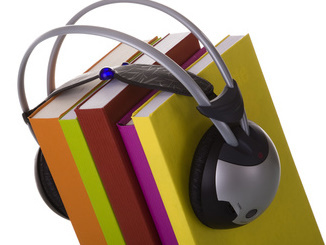 My roommate had dyslexia and discovered she could complete assignments using audiobooks. She was using a free service for the blind the Library of Congress still runs to obtain (at that time) tapes of books ranging from English Lit classics to even a few textbooks. And unlike much of what I read at the time, her books are burned in a part of my brain clearly reserved for sensory experiences. When I show students the MP3 download option many of our databases (thanks, Gale!) now offer their eyes widen with glee/relief. Adult ed students love the idea of downloading an MP3 to play on their iPod during their work commute. Trad students giggle when I suggest creating playlists of articles to listen to at the gym, but they get the idea. Which is that a group of individuals who already have ear phones constantly plugged in can access materials in ways that have meaning to them. Or that learners who prefer to listen can do so. Or people like me who remember what I hear more than what I see have that option. Plus, the optometrist just prescribed reading glasses, another reminder age is punching me in the gut while I’m already on the ground. Listening can give my weary eyes a break. Audiobooks and MP3s of 17-page journal articles are not cheating. At a recent meeting for our Big Read committee, a non-library member confessed she never reads. However, she listens to at least one audiobook a week. The librarians protested vehemently, ‘but you ARE reading!’ She demurred and thanked us for being so nice. But seriously, listening to “Harry Potter and the Deathly Hallows” helped me drive eight hours in a midwest snow storm and not worry a stitch about the weather because getting Harry to Hogwarts safely trumped all. I dearly love the mere act of reading words on a page, but listening gets all sorts of synapses firing in my brain so that the words become more immediate and multi-sensory. Listening to material can create more of a conversation between myself and that author in which I feel compelled sometimes to respond audibly (“no you di’int!”). Listening to words can transform reading from a duty, a job, an assignment into a pleasure, a creation, an opportunity. Many colleges and higher ed institutions are still debating the place of talking books in the academic library. And some studies are available on their use. Some enterprising librarian (not me anytime soon) needs to partner with faculty on using audio versions of class texts and report the results back here. We can even record a version of your results for people like me to listen to. Goodness knows I’ll remember them better that way. Perhaps Jim Dale will be available. Project Gutenberg’s ultimate resource: want something in Sanskrit to listen to? Or perhaps you need to download “Little Women” for a car trip, voici! Loads of languages and books. Librivox: they work with Project Gutenberg to bring you the finest in free audio versions of things college students are forced to read and fun stuff like Jane Austen. Free Culture: includes 150 free textbooks of quality for I cannot vouch. Throw this site your faculty’s way and see what they can incorporate into their classes. Free ebooks you can download to your Kindle or read online of books in the public domain, many of which students are required to read. I found numerous audio books and ebooks that are part of the required western heritage class all of our students must take. And free audio language courses, too! Listen and learn, people, listen and learn.